The landlord did some substantial facade renovations, really making the whole mall much more modern looking. You will notice that only the newer, abbreviated A&P logo is on the storefront, but this store was never a Fresh Market. The above photo was taken from a hotel-locator website. Foodtown redid the logo, obviously, but also added some department signage across the front. It makes the facade a little more interesting, especially since there are no windows along the front wall. The Foodtown banner on the far right side is there because there is a driveway that comes in and directs traffic directly towards that part of the building, but none that directs people straight to the main Foodtown sign. Before we go in, I'll explain a little about the layout to give you a better idea of how it's set up. When you enter on the far left side of the store, you immediately make a 90-degree turn to your right. 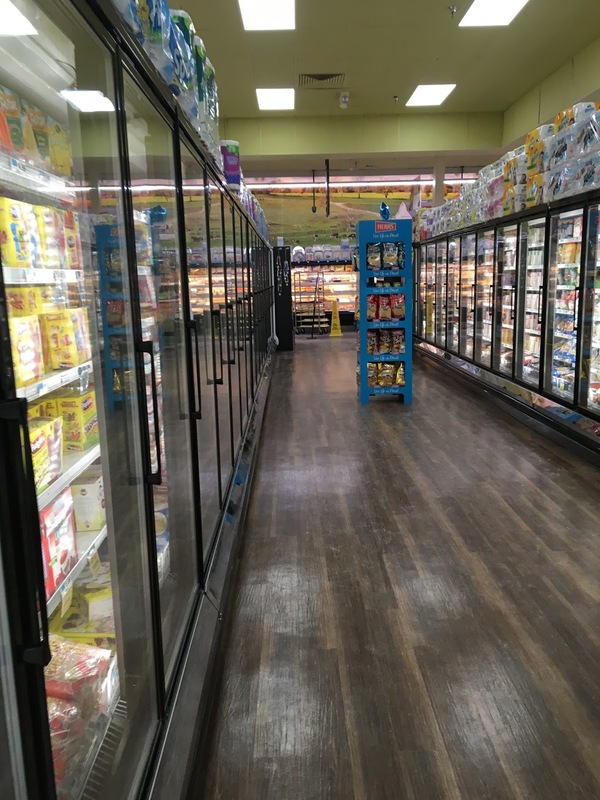 The aisles actually run parallel to the front of the store and the checkouts are along the left-side wall. The corner of the store shown in the photo above is the deli/prepared foods area, with meat and seafood along the right-side wall and bakery in the back right corner. This is a beautiful sight. There were plenty of carts, they were all the same, and they were all brand-new. When you enter the store, you turn right for produce. The checkouts are along the wall behind me here and the front wall of the store is actually the wall visible to the right. All the fixtures and decor are brand-new. It's actually a really nice store, and extensive work has been done after taking over from A&P. These guys actually renovated first, and then reopened the store. The ceiling is painted dark green, which seems strange but is actually quite nice in person. The salad bar is located in the back corner in front of the deli counter. There is also a hot food bar, and the offerings looked really good. This is also a really nice fixture. 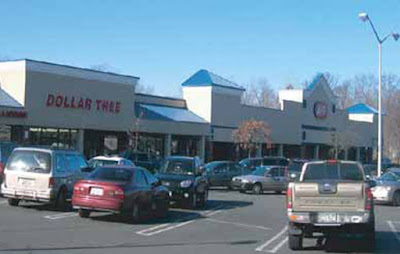 The entrance is straight ahead and the front wall of the store is to the left. The flooring is pretty cool. I'm generally a fan of polished concrete but this fits the space much better. The wood texture along the top of the grocery shelving is a nice touch. I believe the second-to-last aisle is frozen foods. I think all of these cases are completely new. Seafood is along the back wall. It's a small selection but nice, and it's good they included it. Beer and then dairy follow along the wall of the last aisle. I love the clear aisles! You can also see the flooring better here. The brick texture is also pretty cool. I don't know what firm designed this store but they did a great job! It's really attractive and it is also all unified. Here we can see the bakery in the front corner and the front-end which is actually along the side of the store. The Foodtown of Valley Cottage was a pleasant surprise. 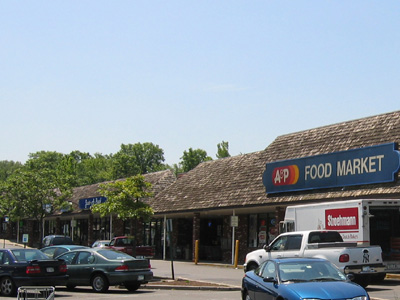 The owners clearly put a good amount of effort into the conversion from A&P, and it shows. I was expecting a quick repaint and reset from A&P, but this was a complete renovation. The store looks amazing but I agree on the shopping carts. Whenever I visit my local Acme or Giant, it's like 5000 different types of shopping carts. One time Giant got in a new shipment of carts, and some actually said "Martins" on it! What suit coordinated that?! Glad to see some chains believe in standards. The other thing that bothers me about mismatched carts is they never fit together in the cart corrals, which is annoying and ultimately harder for them!